I stared blankly back at the newborn nurse, who held a tiny diaper out for me; and it took her a moment to register that I didn’t have the slightest clue how to perform the task that she asked of me. So with a pitiful look of disgust, she taught this twenty-seven year old how to change a diaper. Welcome to parenthood, people. Clueless doesn’t sufficiently describe my entrance into this parenting thing. Frankly, I wasn’t one of those girls who grew up dreaming of motherhood. In fact, I would have called that kind of dream a nightmare. From my perspective, babies were too needy, and toddlers just threw tantrums. Why would I want one of those? Once (once) when I was in high school, I was asked to babysit for a seven year old boy, a five-ish year old girl, and their eighteen month old baby brother. Poor family. Looking back, I’m sad that they had no idea that they were leaving their most precious treasures in the hands of a fifteen year old who had the childcare skills of a dimwit. They evidently missed the look of horror etched across my face as they strolled out the front door for the evening. Thankfully, I think they lost my number. And I vowed to never, ever pursue a career as an au pair. Thus, that was the last taste of childcare that I experienced before my son was born. When my friends had babies, I pretty much avoided them until their children were old enough to use complete sentences. Frankly, the dependence and vulnerability of a small child terrified me. And I knew enough from my babysitting failure that I was not cut out to be responsible for the welfare of a tiny human being. Which explains why, years later, I burst into panic-stricken tears when the labor and delivery nurse told me it was time check out of the hospital. Because, hello reality. Apparently they also wanted us to take this baby boy home. With us. For good. For…ever. With no nursery staff to hold my hand and tell me how to do it. I cannot even describe the holy fear that filled our vehicle on the ten mile drive home from the hospital. All the blogs and books and how-to articles I had read over the last few months were a jumbled blur in my hormone-drunk brain. Luke turned nine years old in December and I still have a holy fear when it comes to parenting. Mostly because I don’t carry an ounce of natural parenting wisdom within me. Sure, I picked up the diapering skills pretty quickly; and I mastered the art of “No-no” when he toddled through the house like a tornado. But parenting is so much easier when they can’t talk back. So like those sweet infants who once scared the living daylights out of me, I’m desperately dependent on God to provide everything I need to mother this child he gave to me. I don’t know that I will ever be able to spell out 5 Perfect Parenting Tips. But if there’s been one single, tried-and-true, cost-effective method that saves the day every single time, it is prayer. Sometimes I wish I approached all of life like I approach parenting. Because I’m wise enough to know that I am unsuited to do this mothering business on my own. So I do it with my face buried in the carpet as pleas fly up to heaven. Since I’ve clearly made a strong case for you to consider me a parenting expert…I’ll refrain from offering you any practical recommendations on how to deal with picky eaters or something. I mean, pop-tarts and all…. Instead, I hope you will forever hold the image of a determined mother parenting on her knees; and I pray that you will parent with a holy wonder, steeped in awareness that you don’t have a clue, and that’s the best place to be. Amy Dalke’s favorite obsession is helping you discover how awesome you really are in Christ. She inspires you to step out of the world’s mold, and to live into the one-of-a-kind shape God designed just for you. She is a baseball mom, a Bible study teacher, and a wife who can’t cook. She has a tendency to be high strung (but is always working on that), and you see her every time you go to the coffee shop. (She’s the girl in line ahead of you with the obnoxious order.) Amy is slightly nerd-ish about the Bible, but it’s only because she’s a mess without it. And P.S., her favorite food is peanut butter and jelly. Follow her on Facebook, Pinterest and Twitter. I love this! Your words hit the nail on the head and many first time moms feel exactly like you did. Thank you for your pure honesty, your humor and your willingness to tell it like it is! Your story will resonate with many. Blessings! Hi! Well, I really didn’t have the overwhelming fear of parenting that you had, but I know you were/are not alone in not knowing what to do most of the time! Between spending my time seeking God’s guidance in prayer and talking with other moms, I did make it through!! Whew! My youngest is 22 yrs. old, and even though I am no longer legally responsible for him, I still find myself worrying and praying for his safety and God’s presence in His life. It really never ends, but just changes. Thanks for sharing from your heart! Parenting is such a huge responsibility and I’ve felt this same fear. 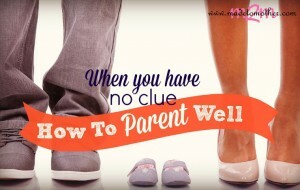 Although my kids are grown (2) and teens (2), I still fear I will mess them up. I am so thankful that God gives wisdom and instruction and helps us to know what to do. Thank you for sharing! Stopping by from Mommy Moments… definitely in agreement about the prayer part. Maybe not so much about putting your face to the carpet when you do it… who knows what’s been ground into there by my 5 kids! We are about to become first time parents, and though I have a reasonable amount of experience with children, I don’t have much with tiny infants. I am always terrified I will break them. My husband will be a natural, but he, too, is terrified. But, we know God will help us and we will learn A LOT! Very cute post! 🙂 This sounds so much like me when I had my first. I never wanted kids, but now I’m kid obsessed! Happy Wednesday! I certainly wasn’t clueless, but I definitely didn’t want children. I knew how much work it all was and how hard it was and wondered why anyone would do that to themselves. Now, I have three. Oh well, life gives you lemons, you make a margarita and make some children! Thanks for linking up with Turn it Up Tuesday. Visiting from Thought Provoking Thursday. Looking for you on Twitter and liked your page on FB. I relate completely to your wisdom. I never had any intention of being a mother, until I became a mother. Now although I couldn’t imagine it any other way, I am mostly terrified that I am completed messing my son up for life. We already have a saving account designated for his therapy later. Prayer and lots of coffee, blazing this trail of motherhood for the un-maternal-ed. Solidarity! God made us different for a reason. Before I had my daughter I didn’t even know how to approach or sweet talk to a child but when she was born that changed….until her teenage years, lol. Thanks for linking up at Thursday Favorite Things, please visit us again next week! I know what you mean. I was 35 when I had my daughter who is now 12. It gets easier and not easier. I can’t explain it. Motherhood is so complex, but it is our greatest jobs. I enjoyed reading your post. I LOVE THIS!!!!! Yes!!! “A mother on her knees because she doesn’t know how to do this parenting thing”…don’t we all discover that moment?! My oldest is 10 at the moment, and most definitely parenting has drawn me nearer to Christ because I am in constant need of him daily. Thanks for sharing this, even those moms who spent their childhood dreaming of motherhood find themselves making the same statements as you just did. Blessings to you! Found you at Faith Filled Friday link-up; sharing this! Thank you so much for your honesty and humour here. I can’t parent without God – truly… I wouldn’t make it on my own. Being a new parent is a very hard at the first time. I also had the same experience. I just thought about getting marriage and had children without thinking and imagining how I can raise them and take care of them at the first time. However, the nature of motherhood just led me to do it. Thank you for sharing.